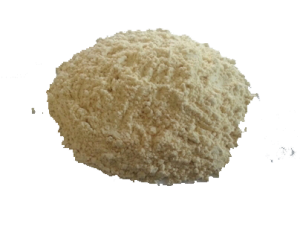 Low fat moderately toasted soft soybean flour (Biopro 20-L) is manufactured of healthy, hulled soybean, by a special hydrothermal treatment within which oil is extracted out and anti-nutritious soybean factors are deactivated. Hydrothermal treatment of soybean without the use of chemical reagents provides products, which contain high-quality proteins and essential amino acids, soybean oil, lecithin, protective nutritious ingredients, minerals and vitamins soluble in fats. Biopro 20-L is characterized, besides extreme nutritious value and good functional characteristics: excellent dispersion and absorbs fats, improves the structure and possesses extremely antioxidative activity. Characteristics of a product, improves sustainability of a final product.